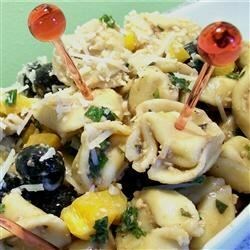 "Serve these marinated tortellinis as an appetizer with party toothpicks. Can also be used for a nice pasta salad lunch in larger size servings ...Optional ingredients: celery chunks, snow peas, artichoke hearts, salami or cheese chunks, green, yellow, or red pepper chunks, thin carrot slices, pearl onions (use your imagination!). Garnish with fresh parsley, if desired." Cook tortellini according to package directions--al dente. While tortellini is cooking, prepare marinade. Combine vinegar, mustard, garlic, basil, chopped parsley, onions, and salt and pepper to taste. Drain tortellini and rinse in cold water. Pour marinade over tortellini, add olives (and optional ingredients, see above) and refrigerate. When ready to serve, add Parmesan and some fresh parsley for garnish, if desired. Serve with toothpicks. I have made this dish three times for different parties and each time it was a success! Everyone loves it. I usually serve it with a loaf of garlic bread. It's always a hit! Made this recipe for a graduation party. I served it as an appetizer with toothpicks. Next thing I knew they wanted a serving spoon so that it could be eaten as a main dish! Everyone loved it. Use bottled Italian dressing in a pinch in place of making this dressing.